HomeBED SORE PREVENTION PRODUCTSMedical Air True Low Air Loss Mattress 80" x 36" x 6"
Medical Air True Low Air Loss Mattress 80" x 36" x 6"
This blower based "True" low air loss mattress system is an advanced hospital grade mattress. It provides exceptional protection against pressure, shearing, friction and moisture. 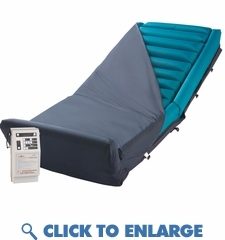 This hospital air mattress is designed for the patient that cannot tolerate alternating pressure or "movement" with the mattress. Therefore, this mattress allows the patient to immerse into the mattress to offset painful pressure points. This creates a comfortable pressure relief support surface while preventing heat and moisture from developing on the patient's skin. Recommended for patients with any stage 1-4 pressure ulcer, myocutaneous skin flaps and skin grafts. "True" low air loss system circulates air through 16 individual cells. The air is distributed equally across the top mattress surface wicking moisture away from the patient-User friendly digital power unit provides rapid inflation and easy set up-Integrated side bolsters keep patients centered in the bed reducing the risk of entrapment-Features "firm" mode for dressing changes and repositioning, and "upright" mode for added support when the head of the bed is elevated-Foot pillow prevents unnecessary skin breakdown due to patient migration. 5 Year warranty makes this low air mattress ideal for long term home health care. Functions include "true"low air loss to manage moisture, firm mode for dressing changes and repositioning, and upright mode for added support when the head of the bed is elevated. True low air loss is distributed equally through the 16 individual air cells wicking moisture away from the patient. Integrated side bolsters keeps patients centered in bed reducing risk of entrapment. Product Name: Medical Air True Low Air Loss Mattress 80" x 36" x 6"